The affordable, lightweight SanDisk Clip Sport Plus MP3 player gives you the freedom and flexibility to work out the way you want. Durable and water-resistant, it’s ready for a muddy mountain bike ride or a trail run in the rain. SanDisk Ultra. Baby Photo Albums. File Support: MP3, WMA (No DRM), AAC (DRM-free iTunes), Ogg Vorbis, WAV, FLAC, Audible DRM. MP3 Players. Camcorder Case. Professional Tripods. Secure Digital SD. Secure Digital SDHC. 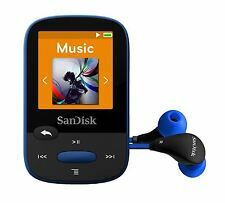 The SanDisk Sansa Clip Jam MP3 Player 8GB - Blue puts the fun back into music-on-the-go with a compact and colorful digital music player you can clip on and take anywhere. Use the built-in microSD card slot to add even more storage to your music player. The SanDisk Sansa Clip Jam MP3 Player 8GB - Red puts the fun back into music-on-the-go with a compact and colorful digital music player you can clip on and take anywhere. Use the built-in microSD card slot to add even more storage to your music player. SanDisk clip Sport Go 32GB Wearable MP3 Player Works with iTunes Voice recording Up to 18 hours battery life USB 2.0 port Plays music, audiobooks and podcasts FM Radio Stopwatch Timer Used condition Formated. All memory free. Dispatched with Royal Mail 2st Class. SanDisk Ultra. Baby Photo Albums. File Support: MP3, WMA (No DRM), AAC (DRM-free iTunes), Ogg Vorbis, WAV, FLAC, Audible DRM. MP3 Players. Camcorder Case. Professional Tripods. Flash Guns. USB Flash Drive. Box Contains SanDisk 8GB Clip Jam 8GB MP3 Player - Black. Use the built-in microSD card slot to add up to 32GB of even more storage to your music player. - 8GB internal storage, with a microSDHC card slot for up to 32GB extra storage. Our light, clip-on SanDisk Clip Sport MP3 Player goes the distance without getting in your way. The SanDisk Clip Sport MP3 Player has a clip that lets you attach it to your shirt, hat, or wristband while you're working out. 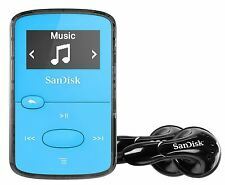 Box Contains SanDisk 8GB Clip Jam 8GB MP3 Player - Green. Use the built-in microSD card slot to add up to 32GB of even more storage to your music player. - 8GB internal storage, with a microSD card slot for up to 32GB extra storage. The SanDisk Sansa Clip Jam MP3 Player 8GB - Pink puts the fun back into music-on-the-go with a compact and colorful digital music player you can clip on and take anywhere. Use the built-in microSD card slot to add even more storage to your music player. Painstakingly refurbished by experienced enthusiast to give u a stunning U2 style Dk Gray & r ed iPo d. iPod classic - 7th gen (thin) -software 2.0.4. 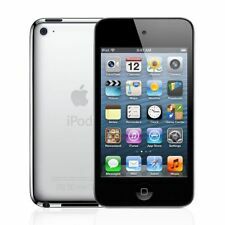 Your new iPod is :-. within a TOP QUALITY Tarkan dual adapter. Maybe the last one online of this brilliant discontinued product.Has a bit of an issue when moving the earphones when plugged in causes the audio to drop out of the one ear. Would only require a small amount of soldering following an online tutorial to fix. Listen to music, audiobooks, podcasts, and other digital audio files while you're working out with the SanDisk Clip Sport MP3 Player. Unlike smartphones or other portable music devices, the SanDisk Clip Sport MP3 Player has a clip that lets you attach it to your shirt, hat, or wristband while you're working out. # Upgraded to a 512gb Hard drive - enough for 50K songs ?. 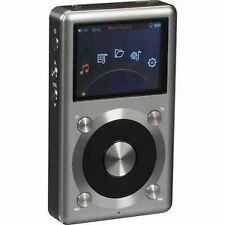 Painstakingly refurbished by experienced enthusiast to give u a stunning U2 style silver & r ed iPo d. iPod classic - 7th gen (thin) -software 2.0.5. This rare Sansa clip 8gb MP3 player is a genuine unopened product. You get an MP3 player with a built-in radio, audiobook function. Built-in clip for easy carrying,Digital FM tuner and built in voice recorder. The latest in SanDisk's audio line, the Sansa c250 2GB MP3 Player provides everything you need to play music, enjoy photos, and listen to FM radio. Easily transfer music to your device in Windows. Import several image formats to your device. 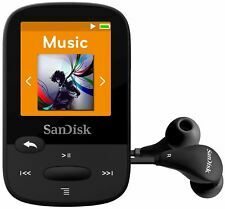 SanDisk Clip Sport Plus 16GB Bluetooth MP3 Player & FM Radio Black! Boxed! 4.5 out of 5 stars - SanDisk Clip Sport Plus 16GB Bluetooth MP3 Player & FM Radio Black! Boxed! 51 product ratings51 product ratings - SanDisk Clip Sport Plus 16GB Bluetooth MP3 Player & FM Radio Black! Boxed! It does not have a battery of it's own so you will have to get one for it, it works with AAA batteries. 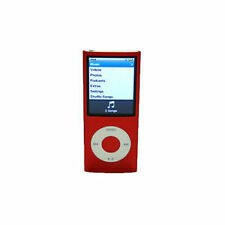 SanDisk 8GB Clip Jam Red SDMX26008GG46R MP3MP4 MP3 Players. Super lightweight wearable personal music player. Deep, rich sound quality. Screen is 2.44 cm white OLED wiith 128 x 64 pixels. Up to 18 hour battery life. Sandisk Sansa M240. 1GB MP3 Player. The affordable, lightweight SanDisk® Clip Sport Plus MP3 player gives you the freedom and flexibility to work out the way you want. With its durable, water-resistant design1, it’s ready for a muddy mountain bike ride or a trail run in the rain. 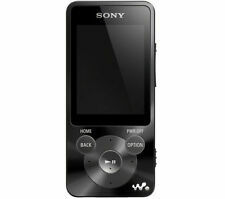 Battery Life Details: MP3 playback - up to 24 hour(s) Video playback - up to 5 hour(s). Supported Digital Audio Standards: WAV, WMA, Audible, MP3. 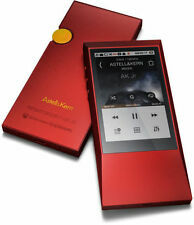 Digital Player Type: Flash based. Digital Player Functions: Radio, voice recorder, photo playback, video playback. Product Line: Sansa Clip. Product Functions: Voice Recorder. 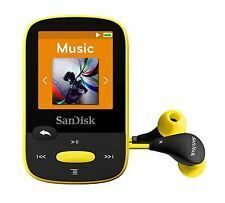 Product Type: Flash MP3 Player. Radio Tuner Type: FM. Display Screen Type: OLED. Green Compliant: Yes. Green Compliance Certificate/Authority: RoHS. SanDisk Clip Jam MP3 player, 8 GB, Black. The SanDisk Clip Jam player puts the fun back into listening to music while on the move. The SanDisk Clip Jam player has 8GB (1) of wearable storage, so you can clip it on and carry your music collection and favorite podcasts or audiobooks anywhere. Series: Sansa Fuze. Battery Life(Audio Playback): Up to 24 hrs. Battery Life(Video Playback): Up to 5 hrs. Microphone: Built-in. Display Resolution: 240 x 320. Display Type: LCD. Parts: 1 year limited. Take the SanDisk Clip Jam anywhere. Just clip it on and listen to thousands of your favourite songs. Available in six eye-catching colours. SanDisk Clip Jam can play your whole music collection in lots of different formats as well as radio, audio books and more. The voice recorder that doubles as an MP3 player The SanDisk® Clip Voice MP3 player is a voice recorder that doubles as an MP3 player. With 16GB capacity, it holds up to 4,000 songs. Whether you’re looking to record a lecture or service, play your favorite music, or both, the SanDisk Clip Voice MP3 player is your go-to device. Lightweight wearable personal music player. 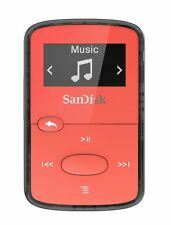 Enjoy music, audiobooks, podcasts, and more while exercising with the SanDisk Clip Sport MP3 Player. Lightweight MP3 player can clip to your clothing during workouts. Actual user storage less. This product supports the popular MP3 and AAC audio file formats as well as Audible (DRM only), FLAC, Ogg Vorbis, WAV, and WMA (no DRM). Sandisk SDMX28-016G-G46K, MP3 player, 16 GB, LCD, FM radio, Black, Headphones included. Sandisk SDMX28-016G-G46K. Type: MP3 player. Total storage capacity: 16 GB. Display: LCD. Headphones included.